When I was a kid, farm life was fun. I got to help dad out in the home paddock, drenching sheep, herding them into the stock yard for shearing, working in the shed, that kind of stuff. I loved riding the quad bike and being useful. Being the youngest, with a know-all big brother always bossing me around, those times with dad were really special. blocks, the bossy big brother, and as well as that, all the stuff I used to love doing had turned into hard work – chores that had to be done before or after school, and unpaid at that. I just wanted out. I knew dad had set aside money for my university education (are you kidding?! Me?! At uni?!) so I fronted him one day and told him I wanted to take a gap year. Well, a bit of a fib. I had no intention of coming back. I just needed the money. Dad wasn’t pleased, and tried to talk me out of it. I got angry. When I look back now, I can see he had my best interests at heart, but at the time, I was hell-bent on catching the first bus to the big smoke. Big bro said nothing much, but shook my hand before I left and muttered something like, ‘Good riddance!’ No love lost there. So with a well stocked bank account and a duffle bag and back pack I headed off to the city. pay for the next hit. Then one night I woke up under a bridge, beaten and bruised, going cold turkey, and having had my money and what was left of my meagre possessions stolen. That’s when I did some serious thinking. ‘Here I am on the streets,’ I thought, ‘when even dad’s hired hands have three square meals a day and comfortable beds to sleep in, as well as a fairly good pay packet to go with it.’ I was pretty sure dad wouldn’t want me back as his son, but he might possibly hire me as a rousabout or something. After all, I did know the ropes, and was familiar with the property. And I had to do something to get away from all this. For the first time in ages I started to think clearly, and plan my future. ‘Dear dad. I’m sorry I haven’t contacted you before this, but I feel that I owe you an apology, to say the least. You were right. I know now that you wanted the best for me. I’m sorry I took the money you’d so generously set aside for my education. ‘I must have hurt you badly. I would like to come home, but I don’t expect to be greeted as a son. I would be willing to work as a hired hand, and perhaps pay you back, bit by bit. I didn’t quite know how to sign it, but ended up with, ‘Sincere apologies.’ and my name. The next day, during the eleven hour bus journey, I thought about why I was grovelling. 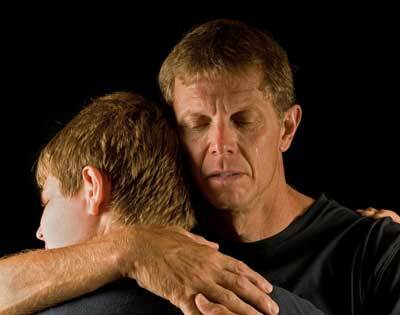 Was it because I was simply in desperate need, and thought dad would be soft touch, and let me back in? Or was it because of my memories of a man who obviously loved me and took such pride in my work as a boy? It was difficult to separate my motives, because both were true. I hoped I wasn’t just taking advantage of his soft side to get what I wanted. I’d done that before, and the memory left a bitter taste in my mouth. I wondered what would happen when I got to the farm. I had memorised the email, and planned to repeat it as a little speech when I saw dad. The five kilometre walk from the town to the farm was the longest walk of my life. I hesitated at the farm gate, took a deep breath, squared my shoulders, and stepped onto the cattle grid. But before I could go any further, I could see a quad bike coming towards me, very fast. It pulled up in a cloud of dust, and my father leapt off, ran to me and hugged me like he never wanted to let me go. Then he held me at arms length. ‘Dad….‘ I began, but never got any further. So dad drove me to the homestead, and true to his word, the tables were laid, the salads were on the sideboard, the beer was on ice in the old wash trough, and the lamb smelt wonderful. The only thing missing was my older brother. After a while I saw him hanging back over the gate. Dad went to talk to him. Whatever was said, my brother was very angry, and stormed off. When dad came back he said nothing, but looked sad. It wasn’t until later, when I was working around the farm, that I got the story from, of course, my brother. I knew I wasn’t the flavour of the month, and had been trying to stay out of his way, but the depth of his bitterness took me by surprise. I’ve been home for over a year now. Dad and I have grown closer, but I can’t say that for my brother. He can’t seem to forgive either of us, and I know that grieves dad a lot. Like I said, I wouldn’t wish my experience on my brother, but sometimes I’m grateful for it, because in a backhanded way, it taught me so much about dad’s love for me. I’d also like to think it’s made me a better son.